In-depth analysis of the TB Evo IV's racing performance and other driver feedback has enabled TRF designers to fully redesign chassis components to optimize center of gravity and secure linear steering feel. One-piece lower bulkhead has been redesigned for more compact, lighter design. Steering unit has been located in even lower position, and totally redesigned for optimized Ackermann* steering geometry. Packed with all-new parts, this chassis kit features sharp cornering and dynamic speed for the most realistic drive feeling available in R/C today. 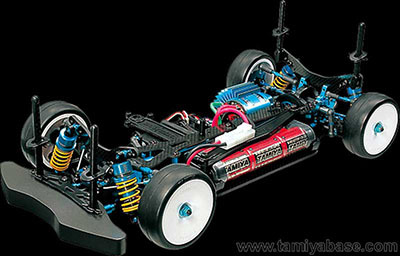 Superior controlability delivers both an enjoyable R/C driving experience, and a potent weapon on the race track.